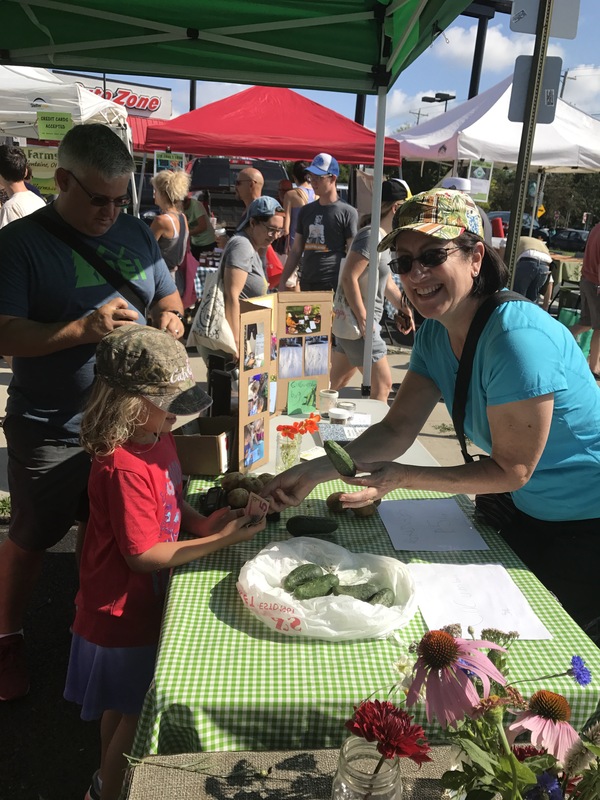 Following my on-site meeting with Columbus City Council Member Elizabeth Brown in May, I was asked to plan an advocacy tour for other members of the council on behalf of the loosely-affiliated Franklin County Urban Farmers Network. I worked with Carl Williams from Council Member Priscilla Tyson’s office to recruit and organize the participants and Mike Hogan from OSU Extension who reserved a 25 seat bus to take us around. And so it was that I found myself downtown Friday morning at 9am picking up Council Members Tyson, Shannon G. Hardin, and Jaiza N. Page. Representatives of the rest of the council members were also with us as well as folks from the City Clerk and Legislative Research Offices, the Public Health Department, Ohio State University College of Agriculture, Local Matters, and Franklin Park’s Growing to Green Program. Following invitations from 10 operations around the city representing a mix of farms, community gardens, and homesteads, I decided to focus this tour on self-identified working farms in the city. Those of us who grow, sell, and regularly distribute produce through CSAs, farmers’ markets, and wholesale agreements face different issues than individuals and neighborhood collectives. The five sites we visited provided a mixed view of non- and for-profit operations, larger and smaller scale operations, on public and private land, in more and less densely populated neighborhoods around town. Our first stop was Franklinton Gardens (FG), soon to be renamed Franklinton Farms. FG Director Nick Stanich described FG as a scattered-site farm that currently occupies 12 lots which total 2.5 acres of growing space, and more in the works. I have visited FG a few times over the years, but it had been awhile. I was amazed to see sites that were not in production a year ago filled with mature tomatoes, squash, okra, and corn. 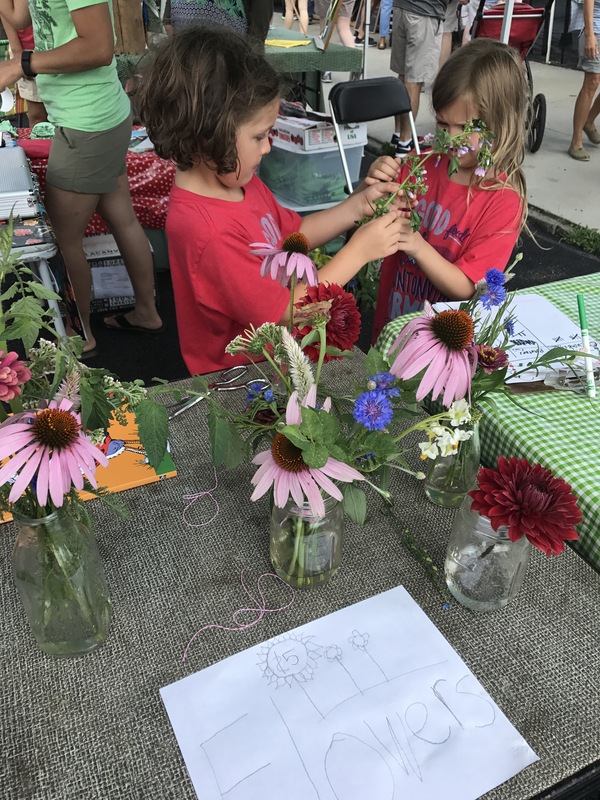 FG is a non-profit organization funded through an impressive combination of grants and donations, market sales, and a 40 member neighborhood supported CSA program. FG was a good place to begin the tour. Participants were visibly impressed and energized by the work Nick and his team are doing along with community volunteers and AmeriCorps VISTAs. Together they are transforming vacant lots of nutrient rich rich, flood-plain soil and run down houses which they have converted into meeting spaces and housing for their volunteers. On the drive to our next stop, Mike Hogan spoke a bit about defining urban farming and differentiating it, and its challenges, from community gardening. He also raised issues related to zoning for high tunnels and on-site sales in residential areas (like ours) as they relate to the Food Action and Green Business and Urban Agriculture Plans City Council recently adopted. I was happy to hear conversations are underway with the zoning office to set guidelines for people interested in erecting high tunnels; checklists stating what’s needed with regard to review and permits for structures under and above certain size thresholds. At this time, high tunnels under 2,000 square feet are not restricted so much as the rules around them are vague. Our second stop, Clarfield Farms, is operated by the MidOhio Foodbank as one mechanism for reaching their overall mission of ending hunger in Central Ohio. The farm sits on land beside a former Columbus City School building, breathing new life into an underutilized civic space. Before the farm was established in 2012, the school had been vacant for nearly a decade. While I have been invited to Clarfield at least half a dozen times, I never made it down before this tour. I’m glad I finally got to see what they have going on and hear more about their programming. Along with 3 – 20×96′ high tunnels and field crops, they host a u-pick plot for neighbors, and a weekly pay-what-you-can farm stand. The farm works with other branches of the foodbank (see for example South Side Roots), partners with other local non-profit organizations, and maintains relationships with local chefs. The farm also hosts a summer youth program that gives teens with 10-week apprenticeships during which they learn life skills they can apply to various personal and professional situations. We heard one young woman report on the impact the apprenticeship has had on her; at 15 she was able to clearly tell us direct and indirect ways she’s developed as a result of her time at Clarfield. Through its portfolio of operations, Clarfield demonstrates myriad ways urban farms can connect with and serve their communities. On the way to the next stop I talked a little more about deduct meters – which came up at our first two stops. With this device installed on our water lines, urban farmers can avoid sewage charges for water that goes into the ground. Having these permitted and installed is time consuming and costly, but can save lots of money over time. Making that process easier, maybe even giving farmers a a subsidy to help pay for installation, would go a long way in supporting the work we do in our communities. I also reiterated the needs Mike set forth for clear guidelines regarding high tunnels, noting a recent round of federal grants that were offered to urban farmers in Columbus, some of whom passed up the money due to uncertainty about regulations. Our third stop was another from my bucket list – Project Aquastar (PA) at St. Stephen’s Community House in Linden. The project has a relatively new manager, Max Slater who has a degree in urban planning and identifies as a self-taught farmer. PA is going through some restructuring including moving it aquaponics production into a new greenhouse. The project currently distributes produce through a new buy one/give one CSA program and through the St. Stephen’s food pantry. Like Clarfield, they host teen apprentices in the summer months. They have great infrastructure and it will be exciting to see how they reinvent themselves in the coming years. Between this and our next stop, Adam Ward, Director of Government Affairs for the OSU College of Food, Agricultural, and Environmental Sciences spoke for a few minutes. He talked about the university’s Discovery Themes, specifically the Initiative for Food and Agricultural Transformation (InFACT). InFACT recently received a major grant from the Kellogg Foundation for the Buckeye ISA (Institutionally Supported Agriculture) program to help mentor low-income families interested in growing food for themselves, their neighbors, and the university. This proposal generated a lot of questions from the council members and staff, as it has in the urban farming community, and served as an interesting point of transition to our next site. Foraged & Sown is a for-profit venture led by two women in North Linden – Kate Hodges and Rachel Tayse. The pair sell wild edibles (foraged) and grow their own (sown) culinary herbs for chefs and home chefs and tea drinkers along with other value added products like seasoned salts and jams. Like other of us farming on the north end of town (Swainway Urban Farm, Peace Love and Freedom Farm, Pettibone Urban Game), Kate and Rachel grow in their front, back, and side yards – anywhere there is soil. This kind of amped-up edible landscaping, like what we do at Over the Fence — using available space to grow food, rather than lawns — builds capacity for sustainability and resiliency in the city. But it’s not always appreciated, nor profitable. Kate and Rachel shared challenges of dealing with formal and informal complaints from neighbors initially skeptical of their activities. Over time those have diminished, due largely to their persistence in speaking with agents who came out to investigate the complaints and inviting neighbors to see what they are doing during open house tours. Foraged & Sown provides an example of issues addressed by individual residents interested in farming on their property as opposed to the other operations we visited growing on vacant lots obtained from the city land bank, leased land from public entities like the school district, or non-profit managed properties. Legislative Analyst Sandra Lopez suggests folks like us go to our local area commissions to introduce ourselves and let those groups know what we are doing and what impact it makes on our neighborhoods. Adam Ward echoed this saying, “The worst time to build relationships is in times of crisis.” Council Member Tyson agreed suggesting “Introduce yourself when you don’t need anything, so that when you do, you’ll have relationships to fall back on.” That’s what this tour was largely about. Our final stop was a quick swing by Over the Fence. On our short drive over, I told everyone a bit more about how I got started farming, a bit about the finances of my operation, and the ways CSA members help me keep things going and looking good. I hope I made clear that our community kitchen garden is not only providing produce to 18 households this season including my own, but also providing a space for building community. It truly takes a village to run this farm. Over the Fence is not a 501c3 but isn’t really a for-profit enterprise either. My profits are not easy to calculate; the come mostly in the forms of food and friendship. That’s alright for me, a middle-class woman with another job as well as a well-employed spouse with great health insurance, but it wouldn’t work for everyone. It requires not only additional income, but also a reimagining of how we define, and measure, profits. I’ve struggled with quantifying this in the past but I think such numbers would speak volumes to legislators, community organizers, funders, and potential future farmers. All the farmers we visited with have already expressed interest in working together to continue communications with City Council. You can be sure I’ll blog about it here. Categories: Farm Advocacy, In the Footsteps of a Farmer | Tags: Clarfield Farm, Columbus City Council, Columbus Urban Farming, Foraged&Sown, Franklinton Gardens, Jaiza N. Page, MidOhioio Foodbank, Over the Fence Urban Farm, Priscilla Tyson, Project Aquastar, Shannon G. Hardin, Urban Agriculture Advocacy, Urban Farm Advocacy | Permalink.